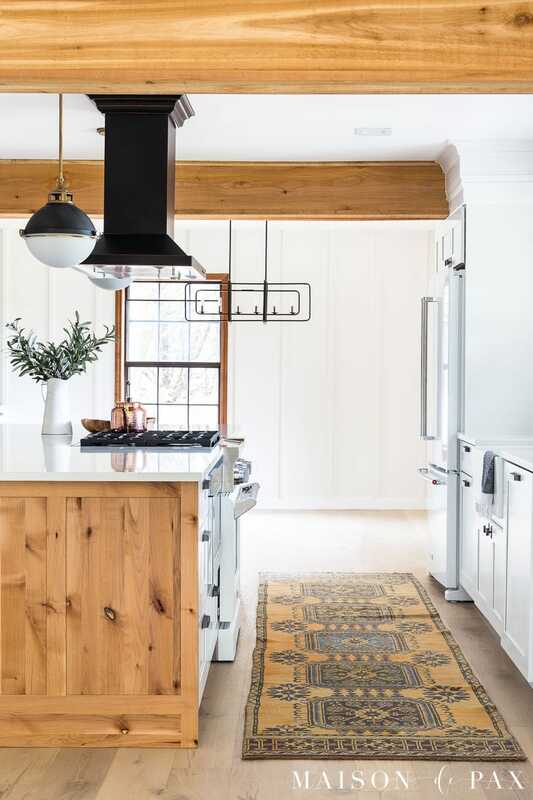 Choosing appliances for an open-concept kitchen can be tricky because they are seen from the rest of your home! 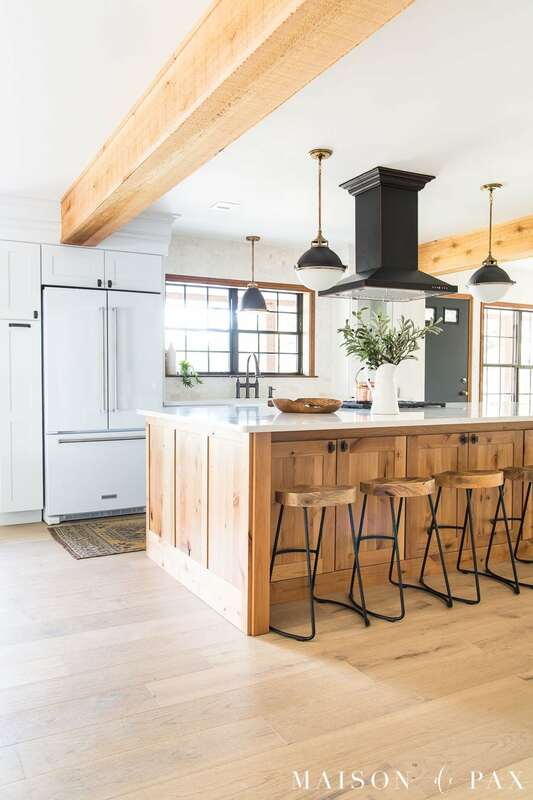 Get tips for choosing the best open concept kitchen appliances as seen in this beautiful rustic modern kitchen. This post is sponsored by The Home Depot. All images and opinions are my own. For years, we’ve been dreaming of a little house out here in the Texas hill country – a place for our extended family to gather. About a year ago, we found the perfect little ranch house on six acres. And one looooooooong renovation later, we’re finally about ready to put this home and its open concept kitchen to good use. 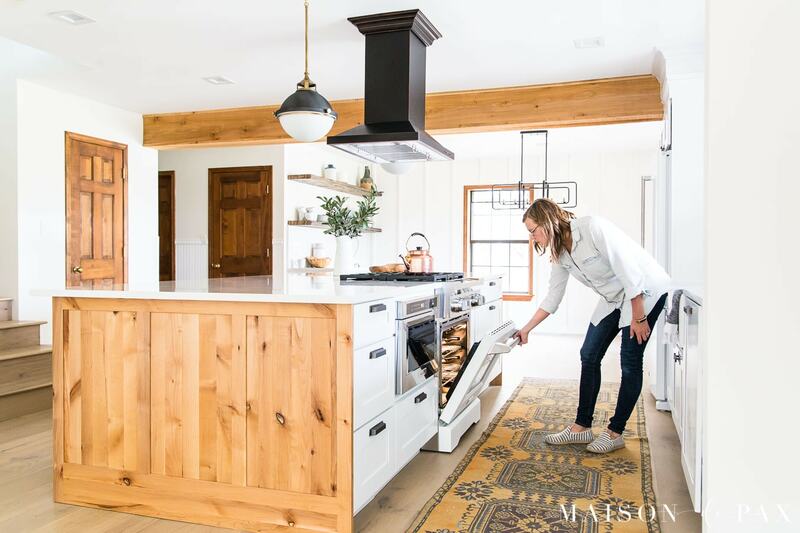 I just shared the full story on the cabinets here, but today I want to cover the other major kitchen staples: appliances. 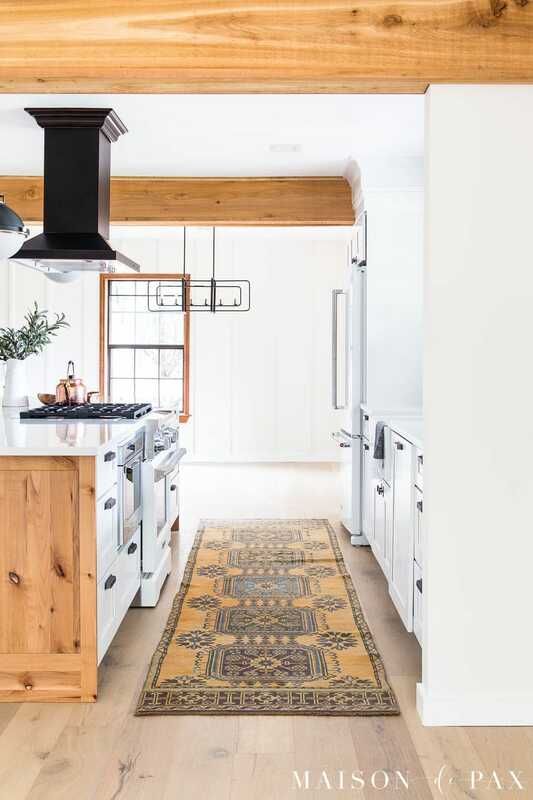 Since the full kitchen is not only visible from the main living and dining space in this house but is practically the central focal point, I wanted appliances that blended in and kept open sight lines as much as possible. 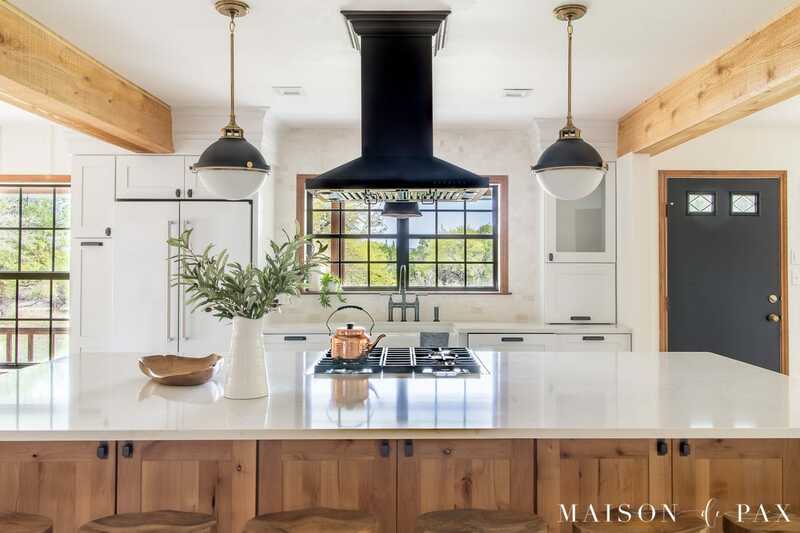 Dramatic, stainless appliances can be beautiful in some settings, but as the gathering point in this little ranch house, this kitchen seemed to need something more understated. Instead of stainless, I went for this white KitchenAid fridge. 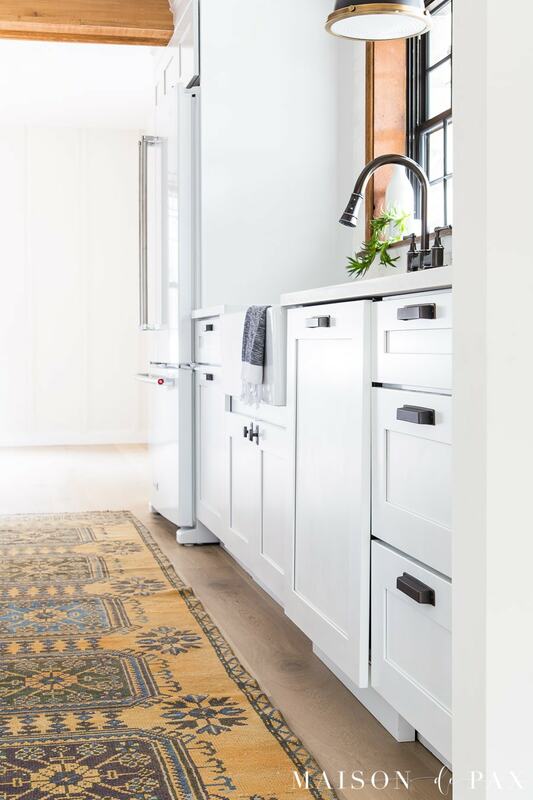 The white refrigerator panels blend into our white cabinets beautifully, while the substantial stainless handles still lend a subtle touch of gourmet, industrial feeling. This panel front dishwasher was perfect, as well, allowing that appliance simply to blend in with the rest of the cabinetry. 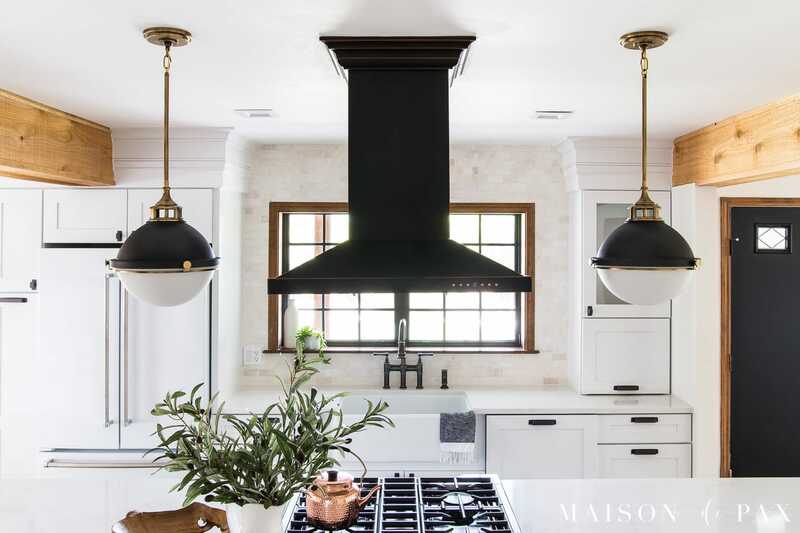 Even the range hood – though bold in black – was chosen over stainless for its classic appeal. 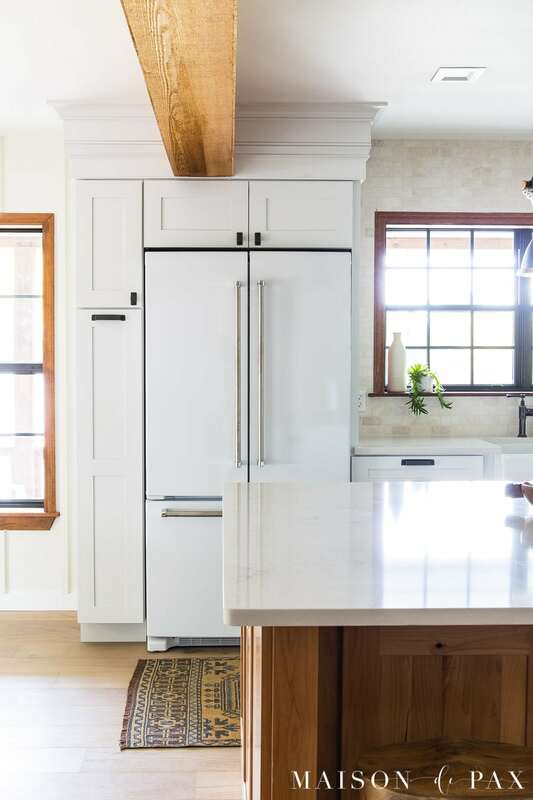 And to be honest, I struggled with that decision a lot… The placement of the range in the island was key to our open concept design because we had to remove two of the original kitchen walls. 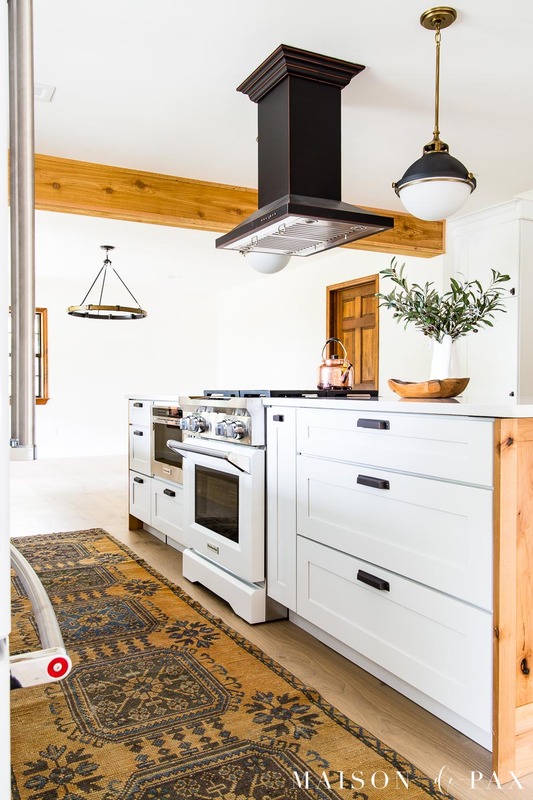 And given the open design, a high-powered vent hood was important to avoiding cooking odors throughout the home. 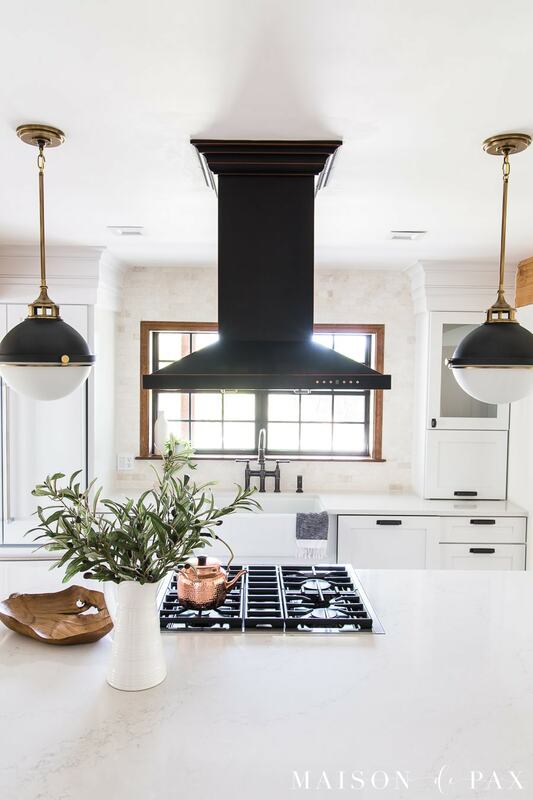 I originally thought I wanted a white hood to blend with the cabinetry, but when I saw this beautiful black one, I decided to give it a try. And it turned out so. much. better. than I had even imagined. I love how it draws attention to the black windows (which are original to the space). The stainless appliances I reserved for the more hidden side of the island. 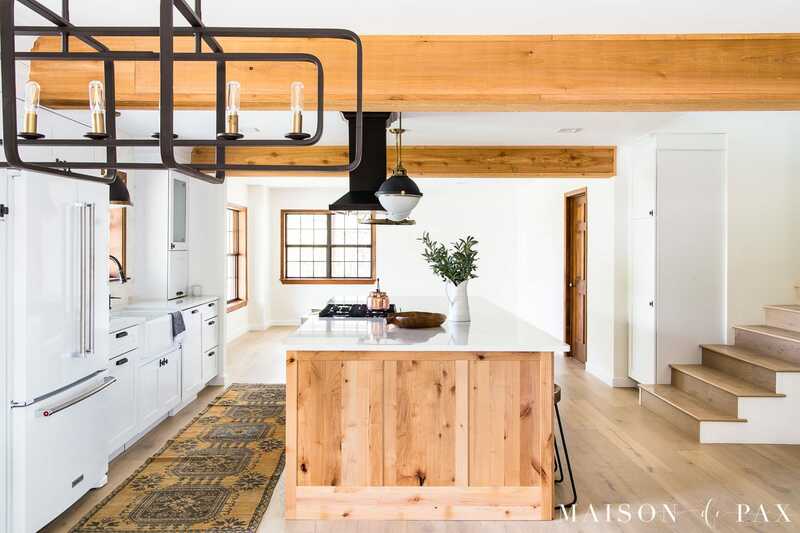 Although open to the other spaces and thus feeling rather large, the functional space of the kitchen is really just the galley shape on the one side of the island. 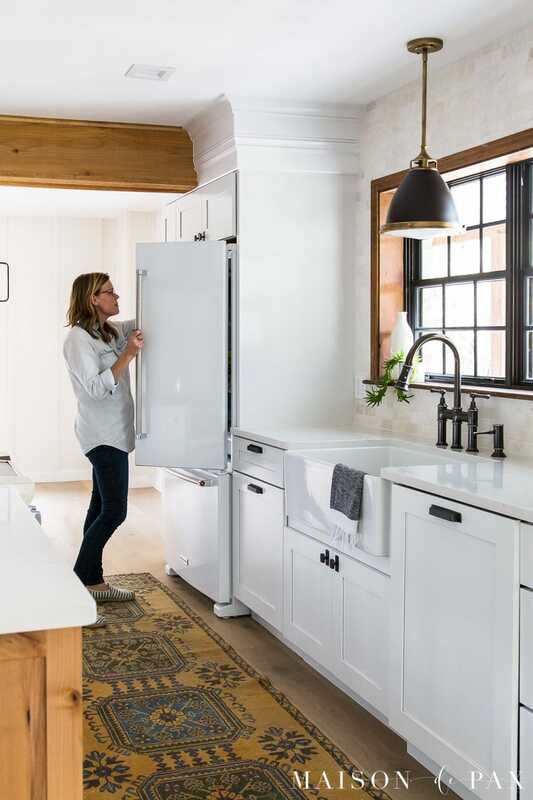 All three parts of the “kitchen triangle” are there: the fridge, the sink, and the range (see more about different kitchen layouts and designs here). 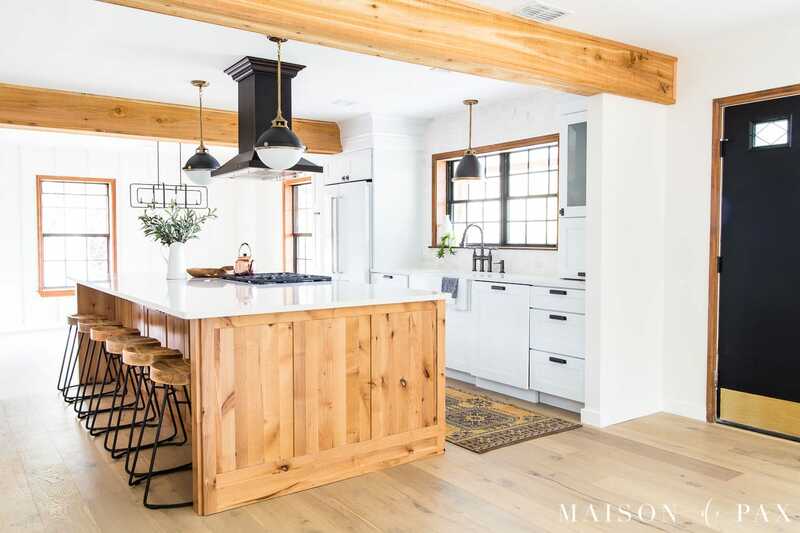 And though there is obviously lots of countertop thanks to the large bar at the island, the working counter space is rather limited – just a few feet on either side of the range and sink. So this microwave drawer was the perfect option to preserve counter space and sight lines in this open-design kitchen. But the 30″ commercial style range is truly the piece de resistance. 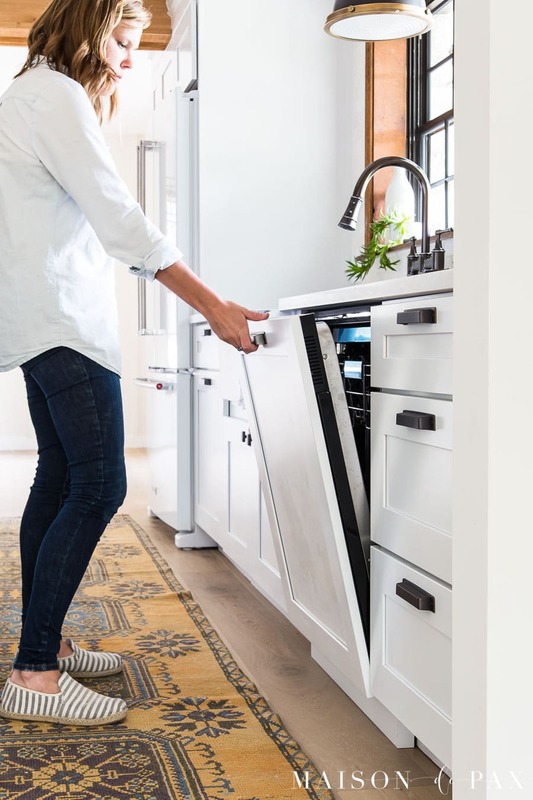 It not only has incredible commercial-grade, dual fuel power, but it marries the microwave drawer (which only comes in stainless) with the white refrigerator. And since they are both KitchenAid, the fridge and range handles match beautifully. I’ve always preferred gas cooktops (but it wasn’t in option in our other kitchen), so I’m going to thoroughly enjoy putting this one to good use. And that’s it! 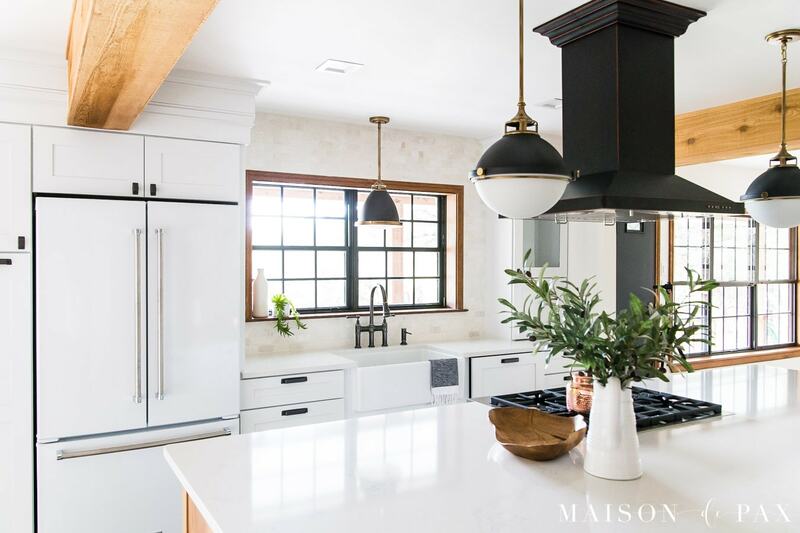 By prioritizing non-stainless appliances that would blend into the cabinets and/or hide under the countertops, we’ve created a modern, functional kitchen with an old-world appeal. 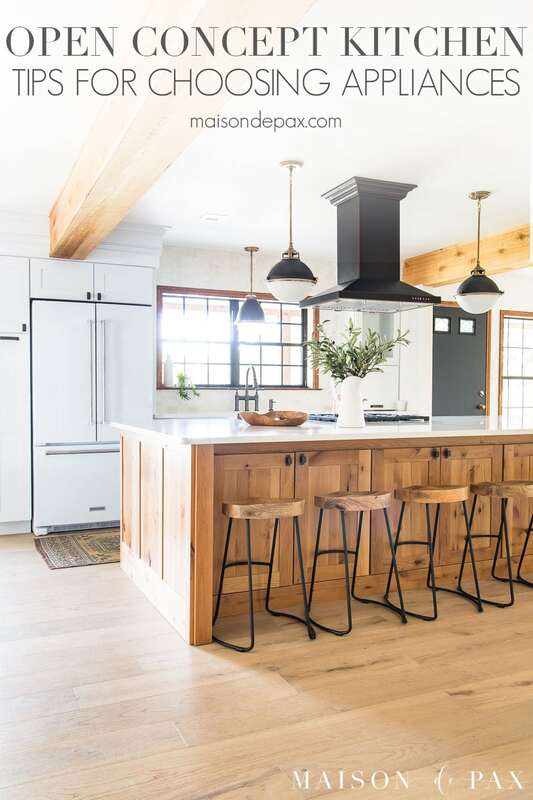 A rustic modern space perfect for our little ranch house… and we couldn’t be more excited. What’s your favorite part? I’d love to know. You can read more about our cabinet choice and design here, and I promise sources for the rest of the space soon! 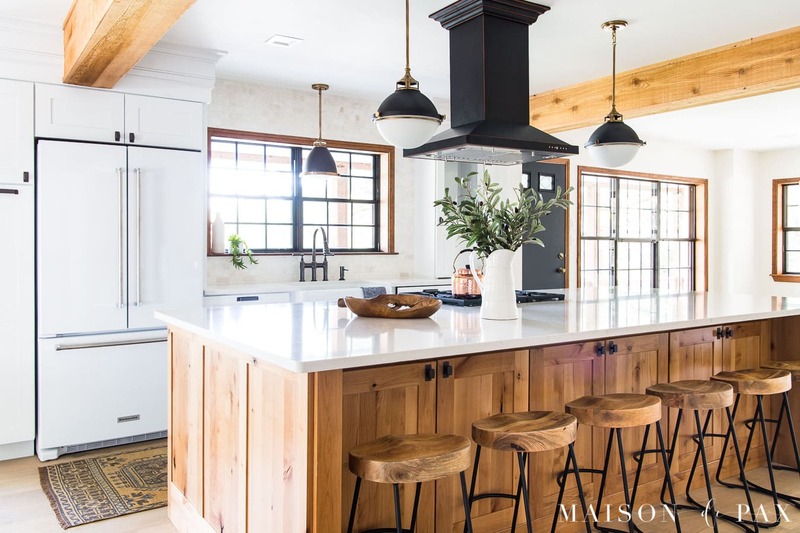 The combination of white, black, and the wood tones in this kitchen are superb! You are right, that black hood creates lots of drama in the space. 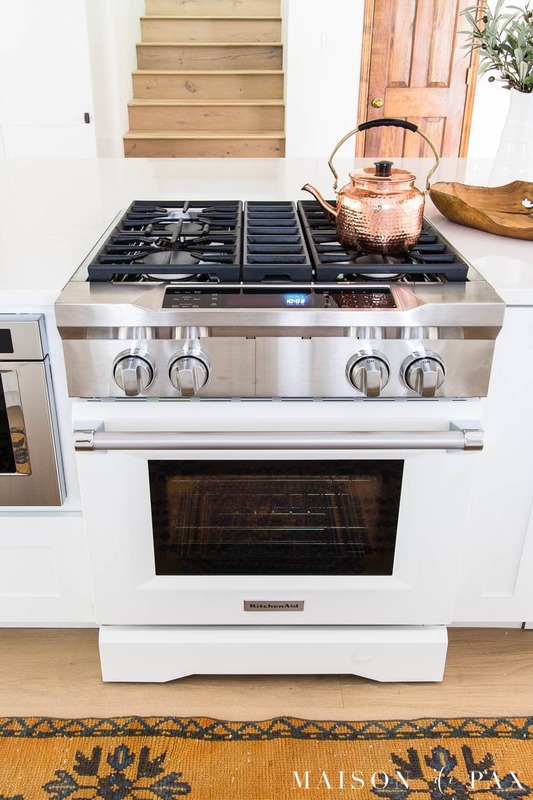 And that white range would be exactly what I would put in my kitchen when we renovate! Off to read the post listing the other sources! Hi Jane! I love all those features. I wanted it to feel different and rustic, true to the area! I hope you find the sources helpful. Laura, that is such a kind thing to say! We definitely work hard to share the best we can with our audience so that you all can use it to translate into your own home. Thank you so much, Juanita! We are so excited to share many family memories here. Rachel, as a fellow Texan I have loved and followed your blog for a while. Once again you have done an excellent job with the ranch house. 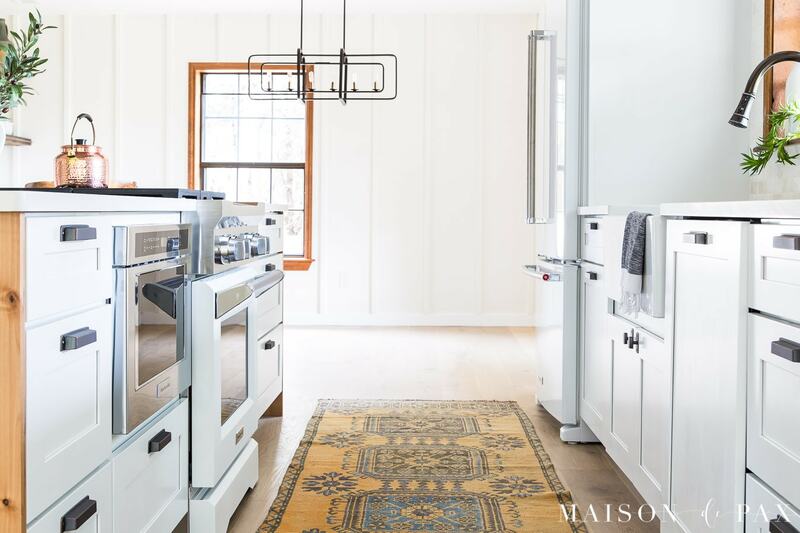 I am in awe of this kitchen! I trust that God will bless you with many happy memories and a place you can pass down through the generations!